If you’re a fan of the Moto MOD designed devices, you’ll want to pay attention to the newest addition to the MOD family. The Moto Smart Speaker with Amazon Alexa is now up for pre-order from Motorola. 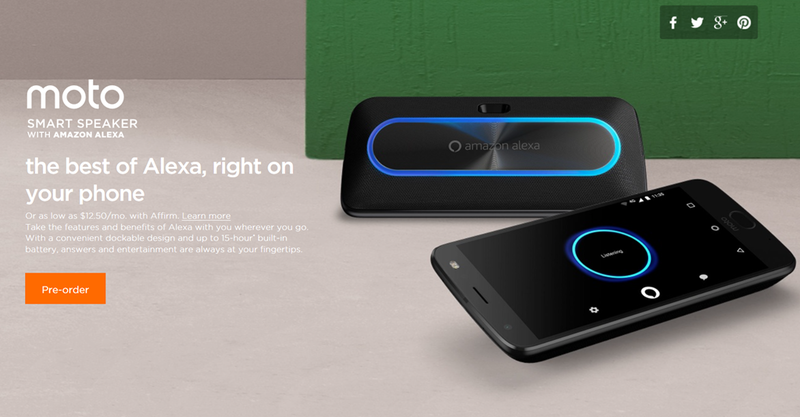 The MOD features Amazon’s Alexa built-in for access anywhere you need her assistance. It also features 2, 27mm speakers with stereo sound, a 1530mAh battery that lasts up to 15 hours and an 82dBSPL rating at a half meter distance. The Moto Smart Speaker is compatible with every device in the Moto Z family. If you missed out on grabbing the original JBL speaker, the new Smart Speaker may be exactly what you’ve been waiting for. Grab one for your Moto Z by hitting the link below.